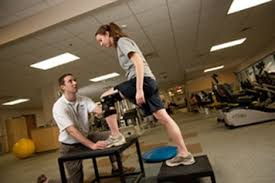 An Athletic Trainer is a person that helps athletes with sport injuries and can also be a doctor. He can decide if a player can play or not and he can say how long they are out. However there are many different levels of this job, theres junior high athletic trainers , theres high school trainers, and even college and pro Athletic Trainers. These are five tasks you have to have for these profession. 1.) Assess and report for recovering Athletes. 2.) Travel with athletic teams. 3.) Care for athletic injuries. 5.) Advise athletes of proper use of equipment. The working conditions for this job are. 2.) Teach people how to prevent injuries. 4.) Consult with doctors concerning players injuries. 5.) Deterine if athlete is healthy. You would need atleast a Bachelors Degree and you would have to take atleast Science and Health related courses. If you were a Athletic Trainer in Texas you would make from $33,990 to $71,270. That means that the range would be $37,280. Myfuture.com presents career, college and the Military as options, allowing users to explore all possibilities and gain insight into each option. More than 900 civilian and military career fields and nearly 7,000 accredited colleges has been made accessible to young adults in one comprehensive site.